Last night at about 11.30PM, I was so frustrated with writing- or should I say not writing- my paper that I had this intense urge to de-stress in the kitchen. I wanted to make a cake. But not just any cake. I wanted to use equipment I had hardly handled before- fondant smoothers, imprint mats, edible glitter, egg white as glue, and most importantly: a tiered cake. OK a tiered cake isn't exactly equipment but you get what I mean. And so I made a wedding cake. Or what I hoped looked like one anyways.. although it was a little on the small side..
That's so typically me. Deciding to do something small and relatively trivial and ending up overdoing it. Like take the instance of me wanting to cook a dinner, not just everyday suppers, but a dinner that's slightly "formal" although only with family. No, I won't just make one starter, one main course, and one dessert. I will make 2 starters, 3 main courses, 2 desserts, and maybe 2 side dishes.. I happen to pile up so much (in any aspect of my life) that at times it exhausts me. But I enjoy it. It makes me feel fulfilled and accomplished. I guess we're all different. Some people like to take things nice and slow and others like to go on turbo speed. Yes, that was my idea of a mini adventure. And so I went buzzing around the kitchen and lining up ingredients that I wanted to use. Butter? Nah. Self-raising flour? Definitely. I came up with a recipe whose result surprised me. Not too sweet but just perfectly moist. Grease and lightly flour two cake tins: a 5 inch one and an 8 inch one. Sift flour in bowl. Add salt. Beat together oil, sugar, and eggs. Add flour to oil mixture, alternating with milk and vanilla. Stir well. Add the raspberries and fold in. Bake at 160C for 30 minutes. 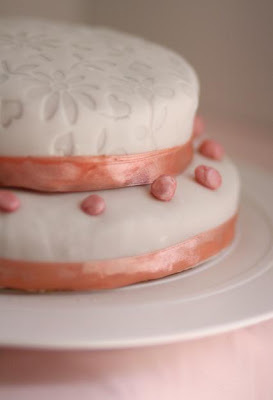 Once cake is done, roll out fondant onto a surface dusted with icing sugar. When you get the appropriate size needed to cover the entire cake, gently lift fondant and press onto cake. Trim off edges. Smoothen with your palms. Decorate as you like. It was my third time to use fondant. The first time I used it was when I placed it on top of a regular vanilla cake. I also cut out little flowers and colored them yellow for that cake. 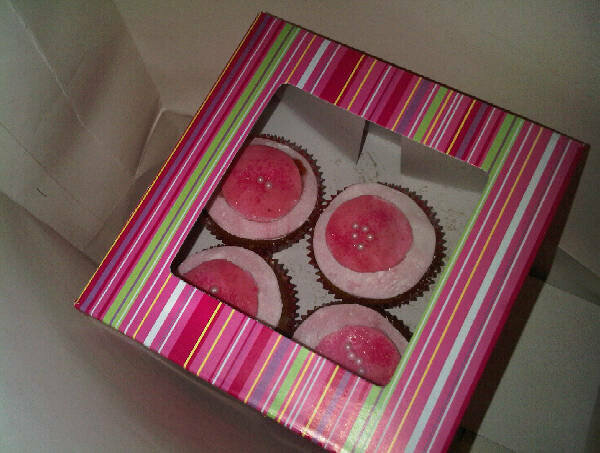 The second time I made some cupcakes with a good friend and used fondant as icing. It was quite fun and we were extremely happy with the result. I wasn't tooooo happy with the cake since it didn't look absolutely PRO. 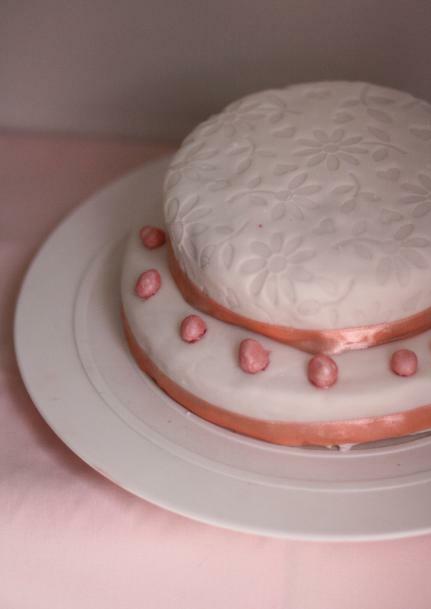 The fondant was dimpled thanks to my fingers and the ribbon was smudged with too much egg white. And I didn't trim the edges of the fondant as well as I would've liked to. But hey, practice practice practice. The little pearls were a later idea of mine. I rolled little balls of fondant and then sprinkled some edible glitter on them and then stuck them on the cake using a little egg white. Well it looks pretty fine to me. Think I'd be very happy to have that as my wedding cake. Sounds delicious too. I made a friend's wedding cake a year ago and it very nearly killed me - but gave me new respect for people who have a way with fondant. This is pretty amazing for a first go, especially late at night! Great writing Sid and trust me, that is VERY good for a first attempt. Many seasoned wedding cake decorators don't even get theirs looking like this. Just think of all the water fountains you have seen on cakes in your lifetime! Very tastefully decorated too! I think its fascinating how you can just walk around the kitchen and concoct your own recipe, just like that...I've always thought baking was a real exact science, and really admire people like yourself who actually have the skill to play with baking recipes. And baking a wedding cake at home is a whole other challenge...don't think I'd have ever dreamed of doing this at home myself! 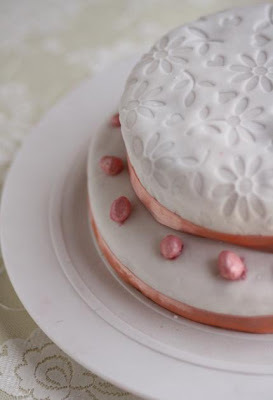 Did you make the fondant too? Long comment...but I'm so amazed and impressed! My goodness! I am a complete ignoramus with fondant and any sort of cake sculpting ... this is an amazing cake. Kudos to you! Can't believe you just whipped this up!! If I attempted to bake at that time of night it would be a disaster let alone trying to get fondant to do what I want. Kudos to you my dear! Beautiful cake! What did you do with it afterwards? OMG...wat a fantastic cake recipe..beauuuuuuuuuutiful clicks.. I think it's amazing that you just whipped up a wedding cake on a whim!